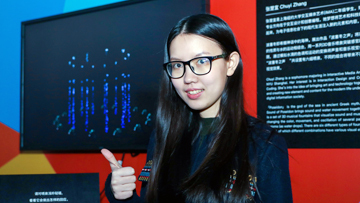 Four selected Interactive Media Arts (IMA) student projects—from an interactive digital fountain to a color-changing constellation—were displayed at the Shanghai MixC Mall in Minhang district as special part of the “INFINITE: Dimensions in Digital Age and Beyond” exhibition on Saturday. This was the first public unveiling of their projects. Titled INFINITE·New Born, the exhibition is a collaboration between NYU Shanghai IMA, Shanghai Film, Radio&TV Production and MixC Mall, aiming to facilitate wider public access to works by emerging new media artists. The four IMA students also served as curation and design committee members of the exhibition. As one of the most influential new media arts exhibitions in Shanghai, “INFINITE: Dimensions in Digital Age and Beyond” hosts a variety of digital and immersive artworks that explore the idea of expansiveness and infinite possibilities, including a visual-sound installation by IMA Resident Research Fellow Cici Liu that depicts the cycle of humans, information, coding, and machine. 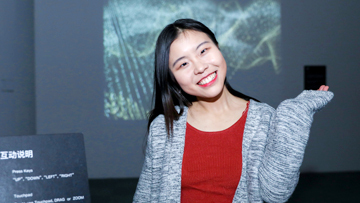 Wang Zihe’s artwork is an exploration of generative art and computer music. The visual pattern is based on the analysis of real-time music and aims to show a familiar environment having many possibilities through visual snapshots that are fleeting and one-time. “I developed an interest in music at a very young age but never really pursued it. 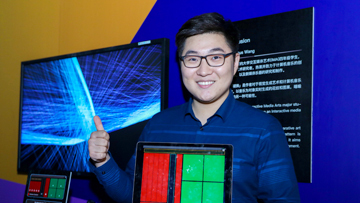 Now, I want to take advantage of my knowledge in computer programming and apply it to music,” Wang said. He Fangqing’s Terrain aims to explore the possibilities of romantic daydreams brought into the context of daily life, with four scenes: mountains, moon, sunset, and a crystal ball. “When I was younger, I had a snow globe with a Christmas tree inside, which inspired my current artwork to be both realistic and fictional: realistic in that each scene I recreated was from my childhood memories and yet fictionalized with creativity and imagination,” said He. 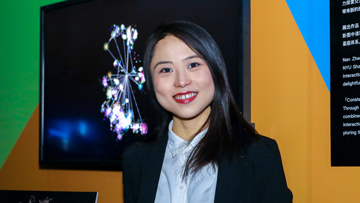 Zhao Nan managed to create an interactive and vivid constellation through the reading of a Bagua graph (the fundamental principles of reality represented through eight Taoist symbols), combined with creative coding. “I have always been fascinated by the movements of the stars and the Law of Attraction. I thought the 12 zodiacs were not enough and lacked individuality. That’s why my artwork has an infinite number of constellations, allowing each individual to define themselves. The Sound of Poseidon brings sound and water movement together. It is a set of 3D musical fountains that visualize sound and music by changing the color, movement, and oscillation of several particle systems (as water drops). There are six different types of fountains in total, of which different combinations have various visual effects. “I was inspired by the Dubai Fountain which was visually stunning. However, I also felt it lacked music and interaction, so I programmed a digital fountain that ‘mingled’ with any sound input,” Zhang said.